Thank you for your support of this run and especially, for the cause behind this run! As many of you may know, Gail Thatcher, one of our own from the running community, has a little girl, Layla, that is fighting for her life. This run is to benefit and offer some support for the Thatcher family. So, thank you all for being a part of this! We have a lot of pertinent information to share with you all before the race. So please, read every word of this notice! Awards ceremony: in between ‘A World Apart’ and ‘Perks Coffee’ over by the river promptly after the race. There should be ample parking space available so early Saturday morning. 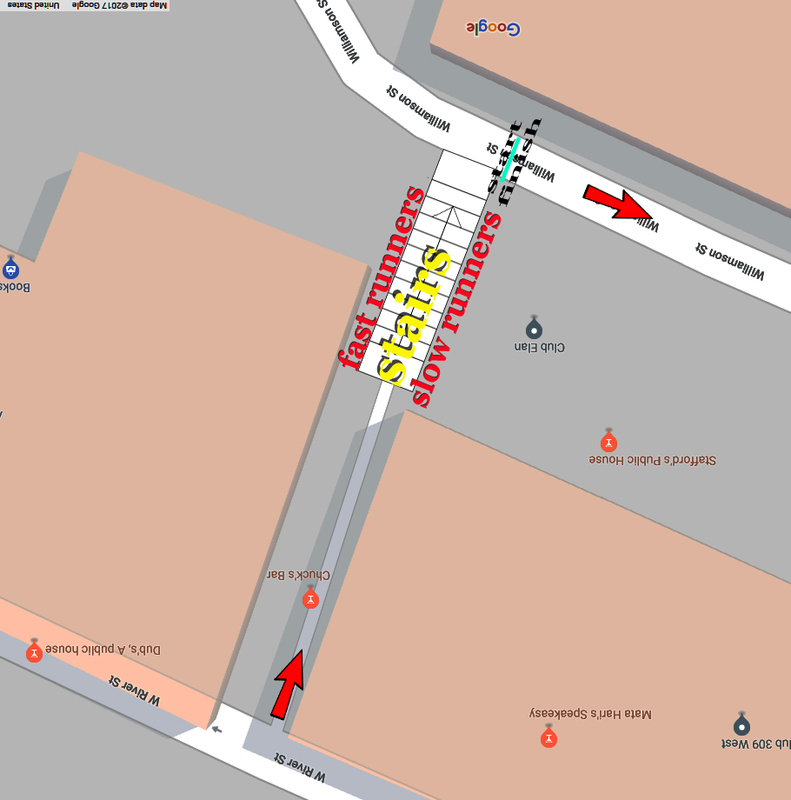 Please refer to the map below for some of the areas where parking is allowed. Please DO NOT park in hotel parking lots and places clearly marked as no parking. Also, you should not have to pay parking meters in the morning. At packet pickup, you will receive your bib number and shirt. Please pin your bib number where it can be clearly seen. The race will begin promptly at 7:00 with runners heading west on Williamson Street. 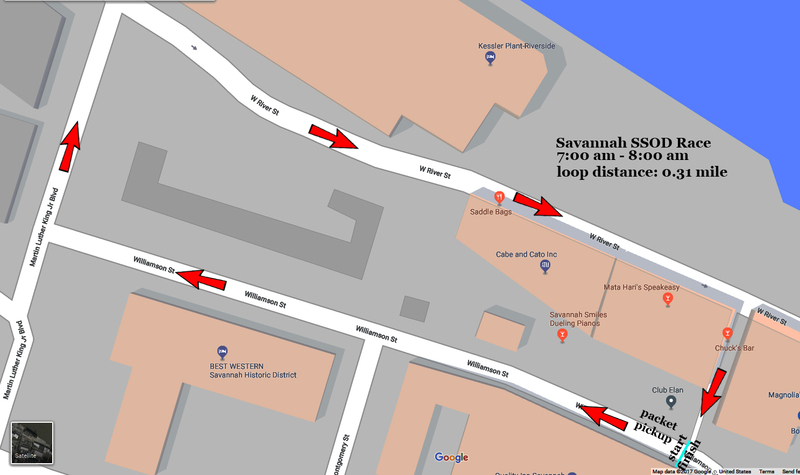 When runners reach MLK they will turn right (north) until River Street. 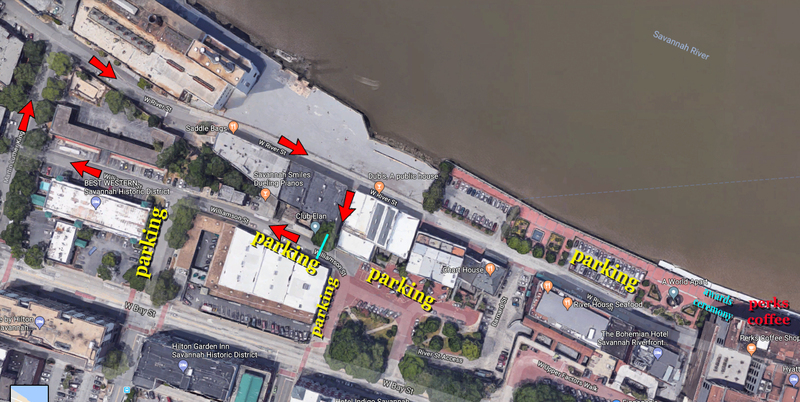 They will follow River Street east and turn right (south) on the pathway between Chuck’s Bar and Dub’s Bar. 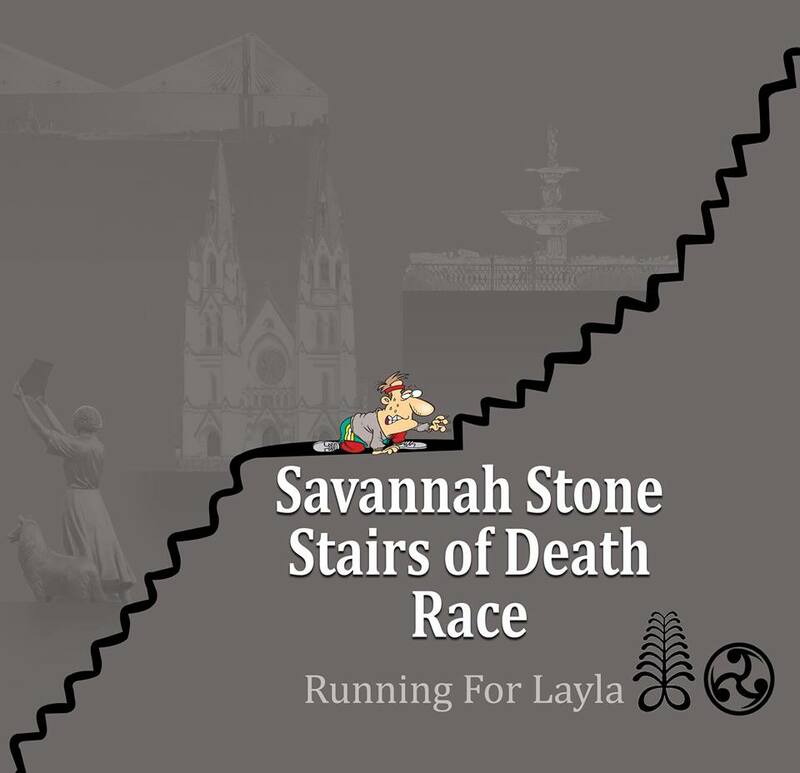 Runners will then run up the steep steps known as the Stone Stairs of Death (SSOD) and turn and head west upon the top of the steps and, repeat the 0.31 mile loop over and over for one hour. Please note, slower runners (and walkers) must use the right hand set of stairs going up, leaving the left hand set of stairs for the fast runners! Slower runners respect that the left set of stairs is for the faster runners! And, faster runners, respect that the right set of stairs is for the slower runners! The SSOD are very steep and uneven. PLEASE BE VERY CAREFUL RUNNING THESE STAIRS! Use the rails as much as you can! Also, you will be running on cobble stone when running on River Street and in between Chuck’s Bar and Dubs Bar leading up to the SSOD. Use caution and common sense when running on the cobblestone. We don’t want anyone twisting an ankle on the course! Use the sidewalk if you can! This is a race! So, please practice noble sportsmanship! Don’t push other runners. If someone is hot on your heels and you’re not going to move faster move over to the side and let the faster runner by. On the same token, faster runners please announce on which side you want to pass by the slower runner. The runners that make it to the top of the steps by no later than 7:58 am will be allowed an extra lap if they want to. Runners, every time you complete a loop call out your bib number! There will be a lot of runners shooting by fast on such a short course! So, please, please, please, help us keep count of your laps by calling out your bib numbers! Immediately, after the race we must move off the course to allow the construction of the hotel on River street to continue! The awards ceremony will be held outside of Perk’s coffee shop and, the World Apart memorial. Each finisher will receive a dog tag imprinted with the mileage they ran. Please be patient as we imprint your mileage on the tag. Go into Perk’s and grab a cup of coffee while you wait for your tag. We will award the male and female that crank out the most miles in one hour! There will be a very simple aid station set up with a water cooler, bananas and tangerines. As with all Rough Runners events, there will not be any cups available. You must bring your own water bottle. Dispose of garbage properly. Littering is a big no-no and will not be tolerated. You may also want to bring with you a bag with a change of clothes or stuff for after the race. We’ll hold onto it for you, if you’d like. Just make sure the bag is one that closes snugly and, has your name clearly on it. After the race, pick up your bag from the timing/packet pickup table. Please note that if you registered after this past Monday, you may not get a race shirt as we only ordered a few extra shirts to keep costs down. You will receive a finisher’s dog tag, though and, if you win the event you will get the top runner award. The proceeds from this run will be donated promptly to the aforementioned gofundme account on behalf of all of you wonderful folks! Thank you all so very much for your support of this run! May you all have very Happy Holidays!